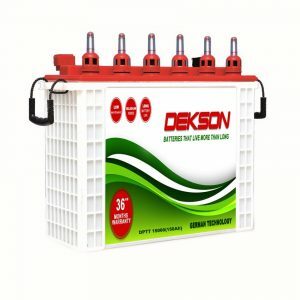 Dekson Tubular Inverter Batteries are low maintenance batteries with positive tubular plates which are known for its excellent characteristic of power back up for longer time duration. It has 8mm Tubular gauntlets from Germany which produces extremely good result keeping the reasonable gap between active materials and electrolyte, ensuring stable performance and it reduces the speed of releasing speed of antimony from the positive grid, thus provides a longer period of power back up and longer life for the battery service too. 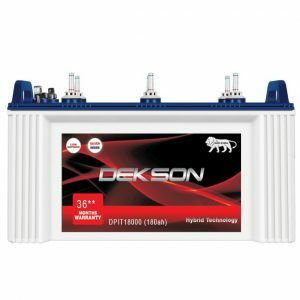 Dekson Tubular Batteries are also uniquely designed which contains 30% more electrolyte which acts as a coolant, controls the rising temperature of the battery and in presence of carbon canister fitted in water level indicator reverts water into the battery which comes out due to vaporization enhancing ultra-low maintenance to it. 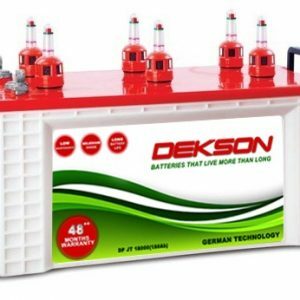 Longer Life– It provides twice the life as compared to the conventional batteries. Extensive Application– Suitable for all your power back up needs. Heat Resistant– High resistance to temperature variation which maintains a low-temperature coefficient. 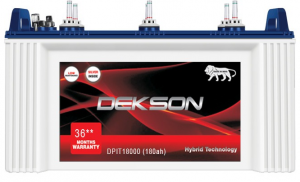 High Cyclic Application– Best used for frequent and prolonged power outages.